Ah, meme time. Not at all a way for me to procrastinate from doing something useful. ceriselle is the name of my website (well, its a nameless site, thats the domain name. I get confused on that sometimes.) I’ve had this domain name for a few years now, and it replaced halcyonic.org. ceriselle is a made up word, from the French words cerise which means cherry and elle which is normally a female thing (its been a while since my French classes) I like it because its a very curvy word! And why is it in lower case? Because it just looks a bit odd to me when its capitalised! Tea is a massive part of my life. Honestly. I couldn’t make it through the day without at least 3 cups. I think the true addiction started in our final year at university, when I lived with Zoe’s husband James. We would take it in turns, along with another housemate Ed to make tea – we got through many many cups, especially around essay and exam times! I’ve written about why I chose to move to Bristol a few times, there are just so many reasons why I am here! My dad and his wife live about a mile away, quite a lot of my friends from uni live around here and its just so different to Chester (my home city) in so many ways! Of course, Race for Life is an important thing to me at the moment. Cancer Research is something I support because my mum and both my grandfathers died from various smoking related cancers. (Its also why I hate smokers, obviously). 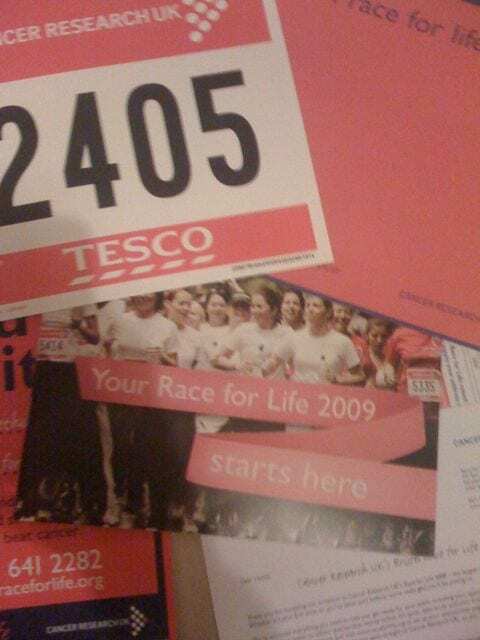 Doing the Race for Life is my way of supporting a charity I like. The other charities I support are Macmillian and Help for Heroes. If you would like to take part, comment on this entry and I shall try to think of five things I want to know more about from you! So after a year off (which was down to my move – when I was in Chester, the event was in Bristol, and when I was in Bristol, it was in Chester! 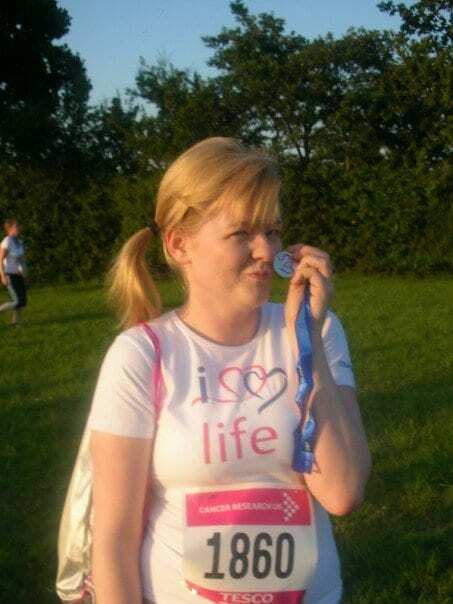 ), I have signed up for the Race for Life again.Ã‚Â I’m hoping to raise even more money this year, and if you would like to donate, you can do it through my page at raceforlifesponsorme.org/hayley_c. I tied my hair up, clipped my iPod Shuffle on, and set off at an easy jog. I got to the bottom of the road, and thought “Hooooooooly CRAP, I’m gonna do this for 5km? !” I managed to jog/run for about 1km and a bit, before having to slow down, because my back was hurting so much. In total I did 2.5km, which was much more than I intended to do! Today, my thighs and legs are aching like crazy. I ache so much! But hopefully the more training I do, the less I ache, and the more likely that I’ll do the full 5k!